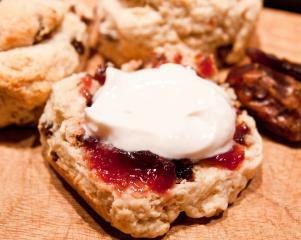 Nothing is as welcoming as a batch of freshly made scones served with jam. Sift the dry ingredients into a mixing bowl. Add the chopped dates. Gently mix in the soy milk and oil until just combined. Turn out onto a floured bench and fold together with your hands a few times. Roll the dough out into a half inch thick square. Cut into nine equal squares. Gently push the edges in to make each scone circular and place on a baking tray.